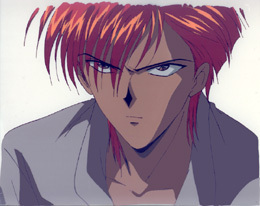 The Details: I like Fushigi Yuugi quite a bit, but because the cels are so expensive I haven't been highly motivated about collecting them. Worse yet, most of my collection delves into the ill-reputed and cheaper OAV territory. I won't be breaking sections down until I scan or maybe buy and scan some more cels. Up next: Chichiri (from OAVs, sorry), Houki with Boushin (obviously from...), more Tamahome and, well, Taka, and a couple more things. In short: Eh? 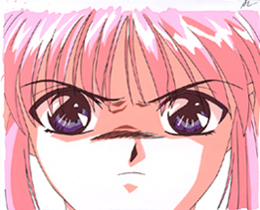 What Fushigi Yuugi collection? Comments: A very pretty, despite the glare, close-up of Chiriko. 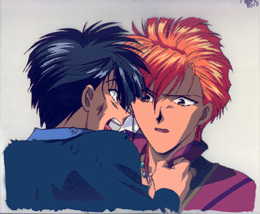 I think it's the loveliest of my Fushigi Yuugi cels, though I'm sure others would disagree. At this moment Chiriko appears, looking a bit scary (for a cute kid). He's ticked off at Rouko for being too cowardly to assist in their attempts to purge a monster from Tamahome's body, and tries to possess him. Comments: This is... Tamahome? SPOILER!!!! At the end of the OAVs, Taka is fighting the other Tamahome. He lectures him about having low self-confidence, punches him in the face, says he won't lose to him or himself (would that be to either of himselves?). This Tamahome fumes and begins glowing for a big attack (here), while yelling "Teme!". There would be an FX layer of red glow over this cel. 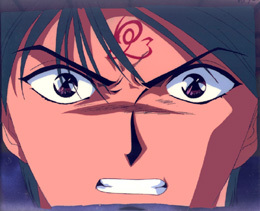 His attack winds up hitting Miaka, who had decided she likes Taka better and therefore stepped in the way. Always was waffly with the men, wasn't she? Comments: Tamahome (as his reincarnation Taka) and Tasuki, the happy brawlers, in the midst of a joyous reunion. The two of them love to fight (with each other, particularly, but nearly anyone is fine otherwise). Here we have Taka's first moments back in the book, becoming reacquainted with Tasuki who just torched him along with the monster behind him. Taka screams into Tasuki's face, while holding his collar, "What's the idea? Nearly burning a guy to death!". This causes Tasuki to ask, afterward, "Is he on some kind of dangerous drugs again?". It's how he is accustomed to Tamahome being when they meet. Yet another cel that fell victim to the dying scanner and has a date scheduled with the new one. Comments: Tasuki in his pajamas. 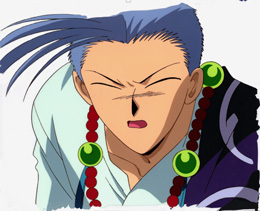 He and Taka just woke up, Tasuki is still sitting in bed while Taka has difficulties with the mirror and yells "Oi! Oi!" at it. Tasuki is busily gawking over it right at this moment, but he does run to Taka shortly afterward. Comments: A nice Chichiri close-up, despite the closed eyes. His eyes don't open often. My daughter hasn't seen this series yet, but she is Slayers fan. 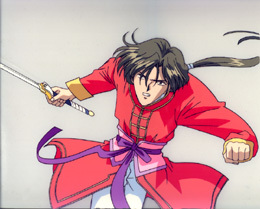 I showed her this cel after I scanned it and told her "He's the Mysterious Priest of Fushigi Yugi". I don't know when this moment happens, but my archaic notes claim it is an OAV cel. Episode #: 51 or 52? Comments: Tamahome, from his final fight with Nakago. This is a large pan cel. It does not fit in the massive portfolio I use for other large cels, and it worries me. At some point the sequence # was trimmed off and taped to the side, likely to make the cel slightly less gangly. As if that helped! Unfortunately I had to use a small low quality scan of this one, but I should be able to replace it with a higher quality scan shortly. Comments: Hotohori, fighting with his sword. I believe this is toward the end of their dealings with the monster inside Tamahome. Maybe I'm wrong, I'll theoretically check soon. If it's not then, it's from one episode before it.